A Resource Page for Internet Classes. NOTE: Most links below deleted due to the work fixing dead links. Use search engine to find current URL. 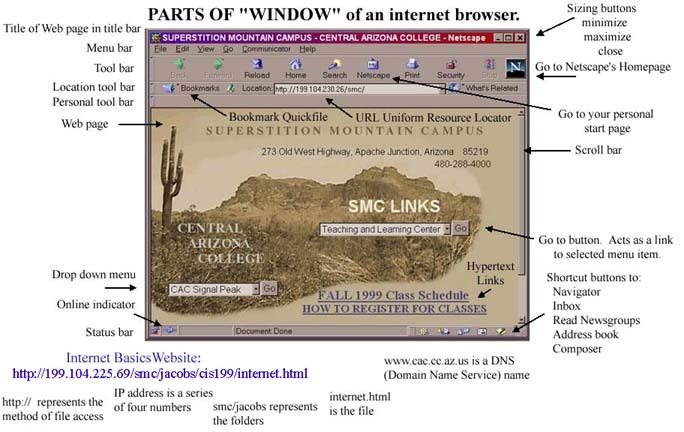 Using Netscape Browsers. Netscape has many resources to make it easier for you to use your Netscape browser. Whether you're installing Netscape Communicator for the first time or are a power user, you'll find something of interest here. Check out the Netscape Communicator 4.5 Tutorial for New Users. The webTeacher site provides a convenient list of topics that help you navigate directly to the topic of your choice. They also have an internal search engine. You can choose between Netscape and Explorer tutorials and between Macintosh and PC platforms. Many people use the NCSA Beginner's Guide to HTML as a starting point to understanding the hypertext markup language (HTML) used on the World Wide Web. Finding Information on the Internet: A Tutorial. A comprehensive resource of information about the Internet and how to search. Great for newbies or advanced searchers. LEARN THE NET: The Interactive Search Engine Tutorial. This interactive tutorial will step you through using Alta Vista's "simple" and "advanced" search engines. Finding Information on the Internet. Teaching Library Internet Workshops, University of California, Berkeley. Bookmarks in Netscape Navigator. When, why and how bookmarks are used. Organizing Bookmarks in Netscape 2.0 and Above features great illustrations. Paint Shop. Download Paint Shop Pro for Windows. Adobe GoLive free 30 day trial version. MacroMedia Dreamweaver free 30 day trial version. Jumbo: Shareware and Freeware. Thousands of shareware and freeware programs have been grouped by topic, with links to multiple FTP archives for downloading. C/Net Download.com. Download demos and freeware for apps covering everything from business to games. File Mine. MPnet's searchable archive of downloadable shareware files. Applications are organized by category. Completely Free Software. Free software for Windows and DOS. Games, graphics, utilities, multimedia and more. Shareware Central. Shareware Central is the shareware directory, with reviews, links, and contact info on many different shareware titles. download.com A shareware directory from CNET. Wilson's "Free Gifs & Animations". You may save and use any gif or jpg on our pages for personal or business sites if you include a link from your page to theirs. Web Graphics on a Budget - Paint Shop Pro Tips & Tricks. Web graphics tutorials using Paint Shop Pro. Free Web page graphics packages. Animation Factory. Lots of original free animated gifs, clipart and web graphics. Free Stuff Center Includes free catalogs, fonts, games, graphics and more. The Free Site. An excellent resource for freebies, including free products, graphics, services, product samples, games and much more. Windyweb.com Free Graphics and Web Design Resourses. PKZIP for DOS and OpenVMS. The latest in a tradition of compression utilities from PKWARE, Inc.
PKZIP, PKUNZIP, WINZIP - ZIP for windows(Shareware). PKZIP extraction utilities. Download all the latest shareware ZIP and UNZIP Utilities including WINZIP and PKWARE. Deja.com is a portal site offering various newsgroups. Liszt, the mailing list directory. Search Liszt's main directory of 90,000 mailing lists or browse the directory topics and sub-categories. Liszt's Directory Usenet Newsgroups. Choose from 30,000 newsgroups, 80,000 mailing lists, 25,000 chat channels and more. Directory of Scholarly and Professional E-Conferences. Search discussion lists, newsgroups, MUDS, mailing lists, interactive Web chat groups and more. For topics of interest to scholars and professionals. The Internet for Dummies (6th Ed) -- John R. Levine, et al; Paperback. How the Internet Works, Millenium Edition by Preston Gralla. Exploring the Internet with Netscape Communicator 4.0 by Robert T. Grauer, Gretchen Marx. Surfing the Internet With Netscape Communicator 4 by Daniel A. Tauber, Brenda Kienan, J. Tarin Towers. HTML 4 for the World Wide Web: Visual QuickStart Guide. Creating Web Pages for Dummies (4th Ed) by Bud E. Smith, Arthur Bebak.